Home Buyer Report – What Is It? An RICS Home Buyer Report is a type of property survey that was introduced in 2010 and is strongly recommended for anyone buying a home. The report replaced the former system known as the Home Buyer Survey & Valuation in March 2010 and is an updated and modernised version, often known as the HBR. Currently, the Home Buyer Report with survey costs more than the original Home Buyer Survey & Valuation because it is a more consumer-friendly, streamlined format. The average cost for a Home Buyer Report starts from £400 but you can shop around for prices from different experts and get the best value for money. Always go for a regulated RICS surveyor or a company with a long history of carrying out these reports. Both of these systems are seen as more advanced than the basic mortgage valuation but less than a comprehensive Full Building Survey which is used to get a survey to inspect the entire property. 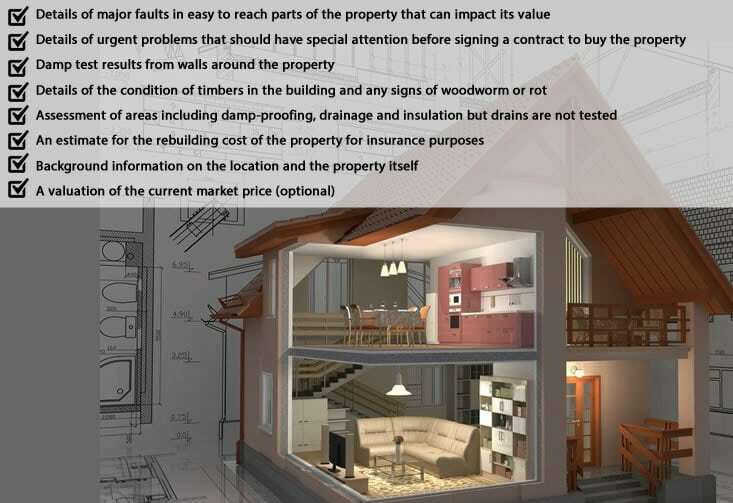 The aim of the HBR is to spotlight urgent matters that can have a substantial impact on the value of the property. It covers all the major sections of the property visible to a surveyor but will not see them lift carpets, flooring or look at the wiring. A summary of the main points will be provided but the full document should also be read. It is written in plain English rather than in technical language, so anyone can read and understand the content. Why do I need a Home Buyer Report? Moving home is a costly experience and it is easy to see the HBR as just another cost to add to the list and therefore consider omitting it. But there are a number of solid reasons why you want to have one. For starters, it offers peace of mind to let you know about any possible problems before you buy a house. We have all heard stories in the past of people buying a house based on what is seen and finding terrible, expensive defects when they move in. Having an HBR reduces the risk of this happening to you. If there are defects or issues, this can be grounds to open renegotiations about the price of the property. For example, will the homeowner drop the price by a set figure to cover the cost of the work highlighted in the HBR or are they going to do the work themselves prior to the sale? You may realise that the problems are simply too much, and you don’t want to go ahead with the sale. This means you can avoid the heartache and extra costs of pulling out at a later stage. Or you may simply work your budget around to be able to cover the cost of the work but are happy to do this because you really want the house. The system behind the Home Buyers Report (often still called a Home Buyers Survey) is to offer protection for you as a home buyer. It is often the case that the seller has no idea of the defects within their properties and helps them make decisions about the price of the house, work that needs doing and other decisions. It also allows you to make an informed decision about a property that represents a major financial and life commitment – after all, you want the property to be right for you and your family in every possible way. And the HBR can help you do this.